In the middle of the day, I sat in traffic to get across the city from the westside of Los Angeles to the downtown LA Arts District. It was a rather frustrating drive considering it was not during rush hour and I was stuck behind a lot of trucks. When I entered The Springs, a sense of serenity came over me. Perhaps it is because it is a yoga and wellness center that lends a calmness to the space. 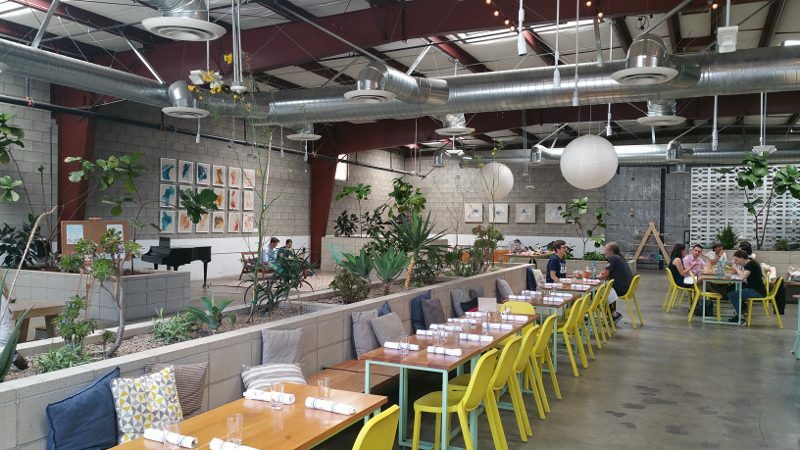 But, perhaps it is the massive open space with high ceilings and the bright color chairs and accents against the slate-gray, industrial base that has a calming effect. As you walk into the space, the restaurant is in the front. Yes, the menu is generally gluten-free, free of refined sugar and uses organic, local and sustainable produce. And it is vegan, except for the sustainable eggs that are responsibly sourced from Petaluma Farms. After all, remember that The Springs is a yoga and wellness center. The restaurant has recently launched a brand new menu from Jasmine Shimoda, Chase Elder and Gregg Drusinsky, a culinary team from New York. Breakfast and lunch is served all day and the food is healthy but also flavorful. The breakfast menu includes cups, such as oats and chia pudding, and toasts with smashed avocado, heirloom tomatoes or banana nut. There are also egg dishes. We chose the shakshuka but opted for the vegan option. 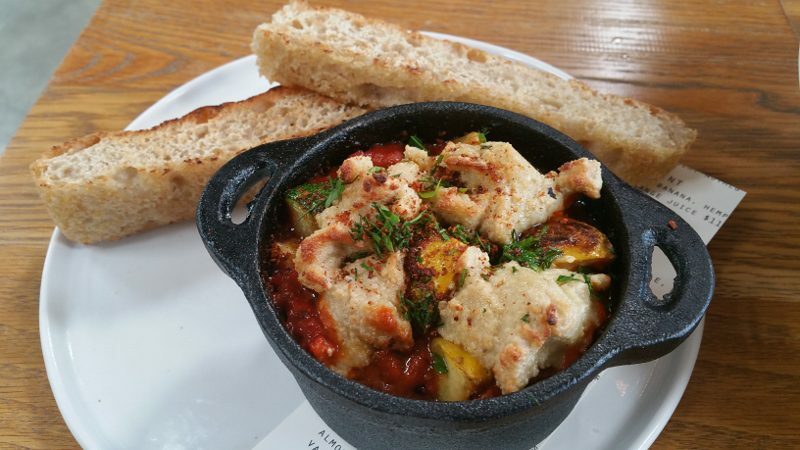 Instead of egg, it is made with stewed tomato pepper sauce, herbs, chickpeas, summer squash and cashew cheese and foccacia. As it was lunch time, we also ordered the summer roll with asparagus from the wraps and rolls section, which is available after 11am. 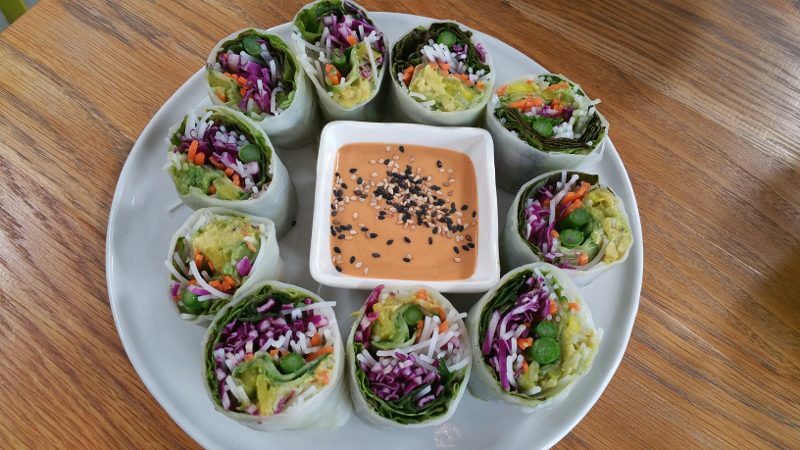 The rice paper rolls are filled with asparagus, Thai basil, pickled daikon, avocado, rice noodles, carrot and lettuce and are then dipped in a spicy peanut sauce. The rolls are so fresh and crisp it is more like eating a salad wrapped in rice paper. We also selected the rainbow bowl from the salads and bowls options. 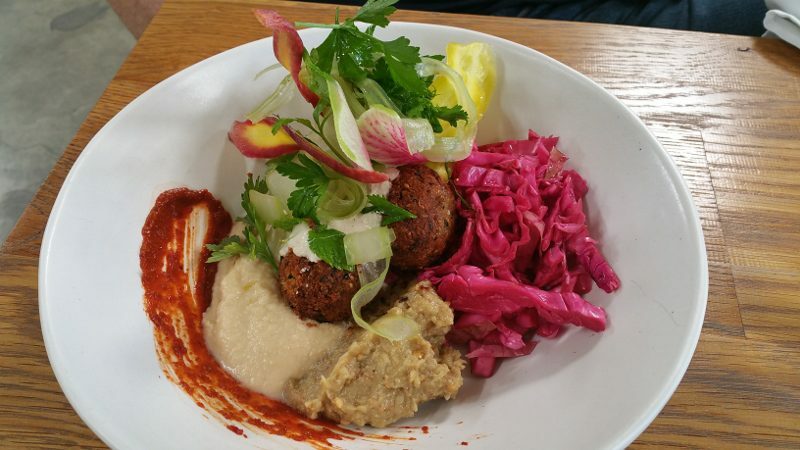 The rainbow bowl is Mediterranean flavors with pumpkin seed falafel, hummus, babaghanoush, pickles, foccacia and tahini. 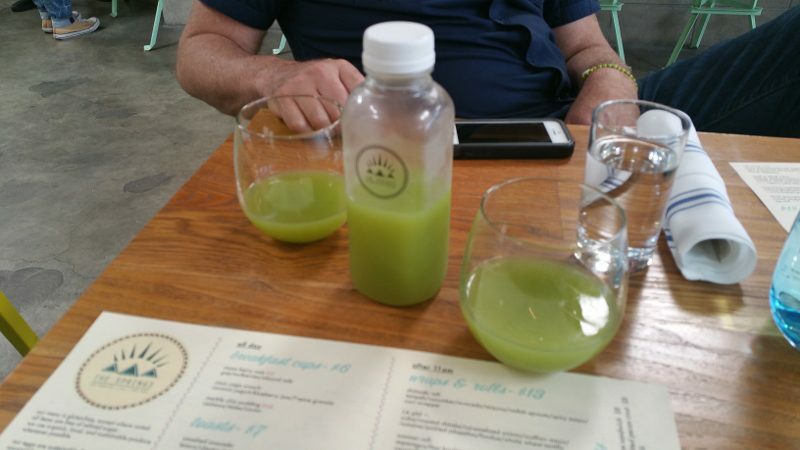 With a juice bar at The Springs, we washed everything down with a new juice made with honeydew, lime and cilantro. It is so new that it did not have a name yet but is was a perfect balance of sweet and tart. 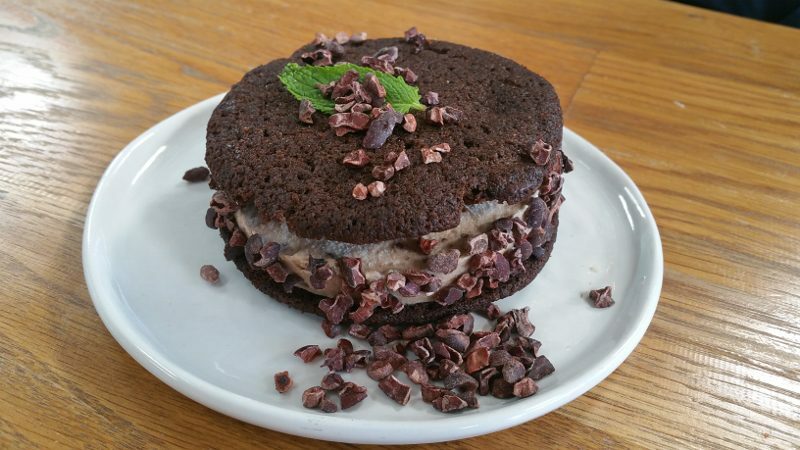 When it came to dessert, we could not chose between the double chocolate mint ice cream sandwich and goji strawberry cheesecake with a salted pecan crust, so we decided to order both. Both are vegan desserts. Even though I prefer real ice cream, the fresh mint flavor and the dark chocolate chips and cookie made this a fresh, chocolaty dessert. 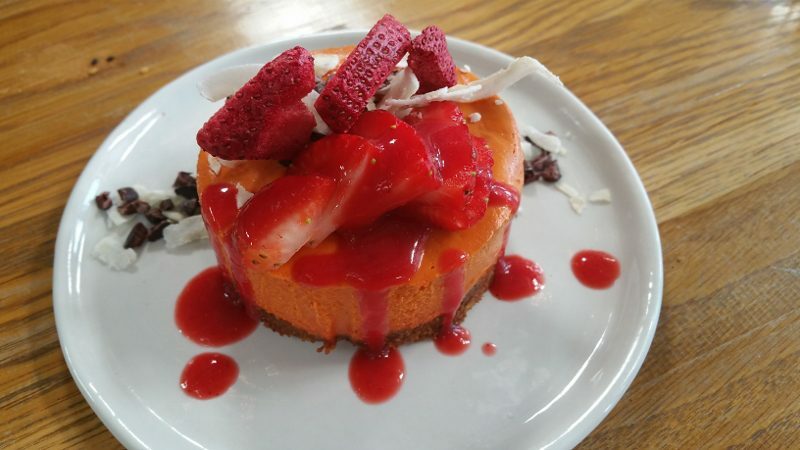 The goji strawberry cheesecake is creamy and tart. Both desserts will satisfy a sweet tooth. 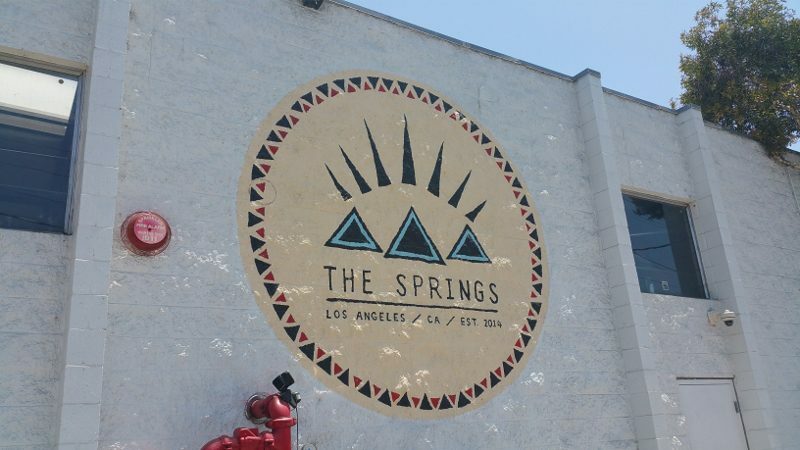 If the DTLA Arts District is not close to where you live or work, know that when you head to The Springs for breakfast or lunch, you can stay for a while and take a yoga class or schedule an appointment in the wellness center. This entry was posted in Food, Lifestyle and tagged DTLA Arts District, food, healthy, healthy eating, healthy food, Los Angeles, The Springs, The Springs LA, vegan, vegan menu, wellness center by Allison Levine.